My search for a perfect Aapam recipe came to an end. Not that amma good make lacy soft aapams but she always uses a pinch of cooking soda. I much strived to avoid it. Hence searched for several recipes both Tamilnadu and Kerala blogs and came decided upon a recipe. Hoila! The aapams were perfect lacy in the corners and spongy in the middles, they soaked with great love the coconut milk which I poured over them. The taste was perfect and no yeasted smell even a bit! Hence wanted to record the recipe in the blog for the rest of the world! So here comes the recipe for Spongy, lacy aapams without cooking soda or yeast! This measurement gave around 25 medium sized aapams. rubbing it 3 times. 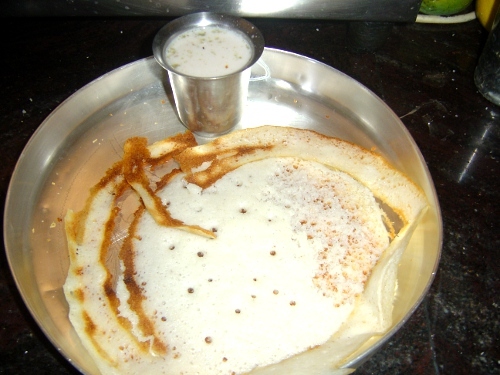 Take the batter and add enough water to make it thin (almost like dosa batter consistency / poring consistency). Let it ferment in a warm place. 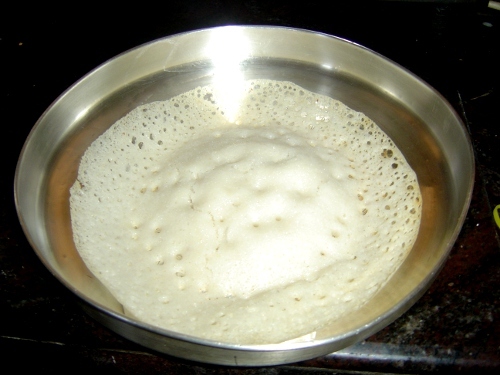 check after 12 hours and if many bubbles appear on the surface it is perfect for making appams. Else let it ferment for few more hours. Grated coconut of 2 medium sized coconuts. Heat the water with salt until it starts boiling. Switch off. Grind the coconut with very little water to a thick paste. Add it to the hot water and cover the lid. Let it seep for 15 minutes. Filter it and squeeze the ground coconut to extract all milk. Take this again to stove top. Mix 1/4 cup of water and rice flour and add it to the coconut milk. Mix well. Add required amount of sugar and cardamom powder. Once the milk it hot enough to dissolve the sugar switch off. Heat the appam chatti. Coat it with a drop of oil using a small cloth ball. Pour 2 laddle full of the aapam batter, swirl, cover and cook on medium flame for 1.5 to 2 minutes. Open and check of the corners leave the sides. Thats the right time to take it out. Serve warm with coconut milk ! Enjoy! This is a story about a little girl who learnt about the value of money and the value of affection at the age of 7 when she was yet a toddler in the ROAD of life. It was Diwali time and she and her two other friends were talking seriously about the new dress they are planning to get for the festival. All the three of various financial status planned to buy a “Salwar set” (too early for that age). This little girl when came home the family is ready to out for a shopping to buy Diwali dresses. Appa has just got his Diwali bonus. Amma selected a gorgeous chamki work Georgette skirt. Having the idea of the salwar kameez, the girl could not open her mouth and say no (actually she liked that skirt too :)) . Nice dresses for her younger sis and brother too were taken (why would kids ever worry about Diwali dresses for Amma and Appa) and the family came home happy, tired and sleepy. As soon as they entered home, this little girl whispered into her Appa’s ears about her friends plan. She never knew that Appa and Amma were skipping new dresses for Diwali. Appa was not well and having a dry cough. He never bothered about anything and said to Amma that he’s taking me out and we will be back home soon. The puzzled Amma said yes. Appa took this girl to a nice showroom in Pondy bazar and took her a red color salwar set with white flowers sprinkled. The little girl liked this dress more than the gorgeous skirt. Coming out he bought her favorite sweet “Soan Papdi”. Munching it she started walking to the bus stop happily slinging to her Appa’s hands. Appa was coughing hard but was talking to her joyously. Suddenly the little girl felt very sad instead of happy. She remembered Amma and Appa did not bu anything for themselves. Apart from her brother and sister, she is getting one more dress just for the sake of her rich friends. And Appa was coughing hard often smiling at her. She felt very bad about herself. Why should she be very selfish? Why she never worry about her father coughing hard? She suddenly felt shameful to be so self centered and with that to show off her new dress to her friends. That moment she decided never to bother her loving Appa asking for anything. She decided to accept whatever he offered her with utmost affection. She decided to give her Amma and Appa all the luxuries she could when she grow up to a big girl. And then she learnt the lesson of giving to loved ones from her dearest Appa. This happened almost 37 years before but she could remember every moment so very perfectly. As today her dearest Appa is not with her she is lingering her good old memories. After shifting to this new place I got introduced to all small grains (siru dhaanya vagaigal) of Tamilnadu. Myself and Amma have tried a set of recipes and now have tried them with Varagu (Kod millet), Saamai (little millet), Thinai (Fox tail Millet) and Kudhirai Vaali. All these grains were available in almost all grocery shops in the southern part of Tamilnadu. People are used to eat it as rice with different Gravies/Kulambus. But I did found them more blonde and hence they need a much spicy kulambu to eat with. Hence I started trying out other type of recipes. Long back I have added a sweet fritter with Fox tail millet. 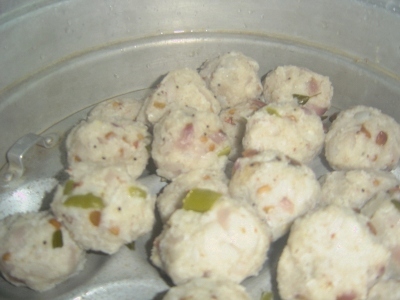 Now I have added a Kozhukattai (steamed dumpling) with Saamai arisi and surprisingly it tasted very nice and almost equivalent to the rice kozhukattai. Only slight variation to the method and amount of water. I would now post a series of all my successful attempts under “Siru Dhaanya Samayal” category. Wash the Saamai arisi in 2 changes of water. Don’t wash it until the water runs clear as it removes the essential nutrients. Soak this for 1/2 hour. Grind it to a coarse paste. Add 1 Cup of water and mix well. Keep this aside. Heat a thick bottomed kadai and add the oil. Add the items under “To season” in the same order and fry till the dals get golden. Now add the chopped onions and chillies and saute in low flame till the onions turn translucent. Sprinkle 1/2 tea spoon of salt and mix well. Now pour the saamai arisi batter and cook in low flame with constant stirring. 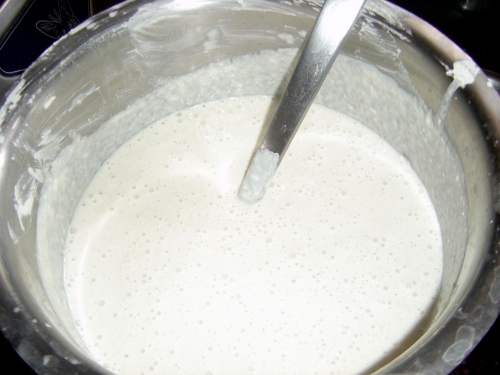 Just turn the contents for 1 minute and the batter would turn a dim white color. One you do not see white streaks switch off the stove and cool it under a fan. Once the dough is warm enough to touch apply little oil in your palms and make small balls (size of a ping-pong ball). Once you make balls of all the dough (Until you do this keep the dough covered so that it does not become dry) arrange them in an oiled plate and steam cook them for 20-25 minutes. Serve them warm with a chutney or you can eat them as it is. It tastes great! I love pumpkins but love the baby pumpkins (the skin would still be a dark green) more because of the soft texture and the sweetness. When my neighbour S told about this sweet kootu I wanted to try immediately but the vegetable markets always sell the big orange skinned pumpkins. In Tamil, the baby pumpkin is called “Parangi kottai”. Check this post for baby pumpkin pics. I waited and found a nice green cute pumpkin and tried this recipe. I loved it but actually could not match it with any dish because of its sweetness. I had it as it is but my friend said it would go well with a spicy adai. In a thick bottomed vessel add the chopped pumpkin and 1/4 Cup of water. Cover and cook in low flame until fork tender. Add the Coconut milk and sugar or jaggery and stir well. Add a pinch of salt now. Keep the flame low and let it start simmering. Meanwhile in another small kadai add the ghee and when its hot add all the other ingredients under seasoning. When the seeds start spluttering add it to the simmering gravy. Mix well and switch off the stove. The gravy is ready. You can have it with rotis or as it is. A spicy adai also would go well with this.